Do not put all your investments in too few stocks and diversify them in different business across various sectors to manage risk. If something can go wrong, it will go wrong but it shouldn’t have a very adverse effect on the the portfolio. Diversified approach not only manages the risk but also reduces the volatility. If a portfolio has less than 5 stocks and if tanks by 30%, it can dampen the performance of the overall portfolio by a big margin. Similarly, if the portfolio is exposed to only a few sectors, the performance can be impacted badly by a bad news in one of those sectors. The best example can be the IT or Pharma sector in the current market scenario where an overexposure to IT or pharma sector stocks can mean the portfolio may not have performed as good as the market. The diversified approach is based on the fact that what matters more in the market is how much you don’t lose in not so best of times. There is a contrasting view to diversified investment which is if you have too many stocks in a portfolio, the good performance of one stock or sector is dampened by the bad performance of other stocks or sectors. So for a well-diversified portfolio to perform, every stock or sector in the market should perform which is quite unlikely. If a portfolio has 100 stocks and one of then tanks by 30%, it may not have a very big impact on the portfolio but the flipside is a rise in 30% price of one stock can also mean no big performance improvement in the portfolio either. Why are Mutual Funds Well Diversified? Mutual funds need to be well diversified because they have a benchmark or an index to beat. They have to invest in most of the stock in the underlying benchmark index or at least need an exposure to most of the sectors in the index. So mutual funds can either be an overweight or underweight on sectors. What it means is, a fund may be underweight on IT and overweight in the financial sector. It means they will have less than index exposure to IT stocks and more than index exposure to financial stocks. 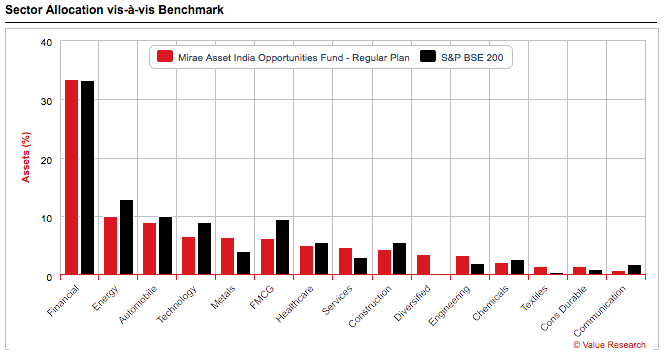 Here is the asset allocation chart from ValueResearchOnline for Mirae Asset India Opportunities Fund which is the best large-cap fund. We see they have under exposure to Energy, FMCG etc and overexposure to metals, engineering etc when compared to the underlying benchmark S&P BSE 200. Which is Right for Retail Investor? The focused portfolio can be managed by individuals but a diversified portfolio with 100 or 200 stocks will be next to impossible to track and manage. On top of that, if you have so many stocks to research, it can take up lot more of your time than you may want to allocate to investing. For retail investor what should matter is absolute returns. So a 15% CAGR return is much better than comparing the return to an index and outperforming it by 2% to 5%. Beating an index can actually mean the portfolio falls less than the benchmark but that shouldn’t matter to retail investor as much as it does to mutual funds. The diversified approach seems a common wisdom but so many investors have made billions with the focused approach to investing. The best approach is to choose the one that is neither too diversified nor laser focused. If I have to put a number of stocks, I will use Ramdeo Agarwal of Motilal Oswal who suggests keeping the stock count close to 20 to achieve a balance between focused investing and well-managed risk of diversified investing and no stock in the portfolio should have an allocation of more than 5%. If your portfolio has too many stocks, trim it down and go for a focused portfolio. 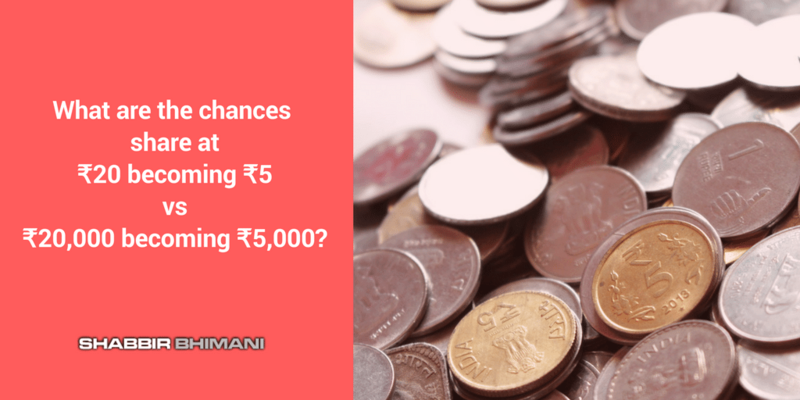 The aim is to beat the returns from the best performing mutual funds and if one can’t beat it, invest in it but if you want to invest in more stocks, opt for a mutual fund because one can perform only with mutual funds and without dealing in stocks.